Peel the 6 raw prawns, keeping the shells. Place the shells in pot with water and salt and bring to boil (this will become your stock). oil that cooked the chicken. Once each of these items are cooked, keep placing them into the paella pan. 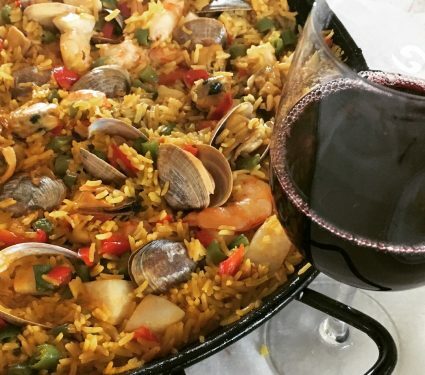 Bring paella pan with all ingredients to the stove and add rice and stir all together coating the rice. Let the rice toast a little. Add chopped tomato and stir then add the chopped Spanish chorizo let the chorizo crispen. In a small corner of the paella pan, LIGHTLY toast the saffron, ensure it does not burn. The saffron is toasted to enhance the flavour. Now its time to add the stock. For each cup of rice add 2 cups of the prawn stock made earlier. If there isn’t enough stock add water. Then add the paella seasoning and stir. Add Spanish paprika and stir. Add salt for flavour according to your liking. While the rice is cooking keep stirring and moving the paella pan around your stove to ensure all areas are being cooked evenly. When the rice is almost cooked add the whole prawns (remember that these prawns are part of the garnish, therefore don’t push the prawn to the bottom of the pan, keep just above the rice but create a pretty design). Add the ½ shell mussels and the whole clams also remembering that these ingredients are also part of the garnish. When the whole prawns turn pink turn them over to make sure the other side cooks also. Then the rice is almost cooked and very little water is left then turn off the fire, cover the paella pan and let the rice settle to absorb the remaining water. Garnish with strips of capsicum and serve.